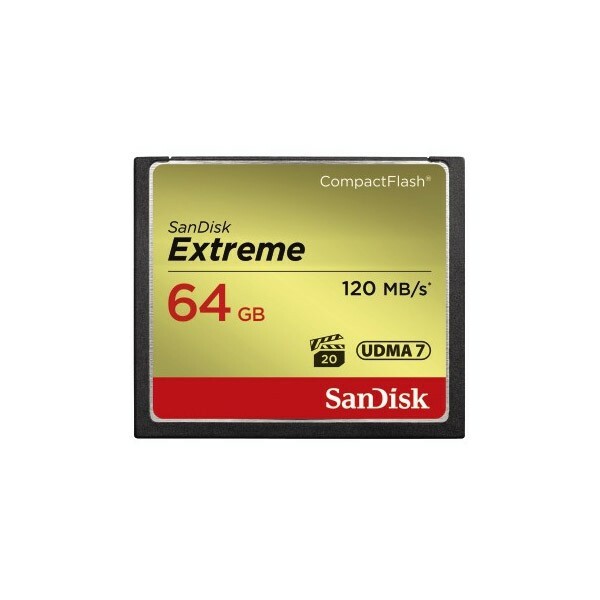 With write speeds of up to 60MB/s, the SanDisk Extreme CompactFlash Memory Card adds to your mid-range to-high-range DSLR's performance during burst-mode shooting, rapid shots, and RAW plus JPEG capture. The card records photos almost instantly, ensuring you will catch your best shot. Read speeds of up to 120MB/s (16GB - 128GB capacities only) make transferring images to your computer fast and simple**. Featuring a Video Performance Guarantee (VPG-20) profile specification, the SanDisk Extreme CompactFlash memory card can keep up with the steep memory demands of professional video equipment such as HD camcorders. The card's VPG-20 ensures data transfer between card and camera with a sustained data recording rate of 20MB/s for a smooth and unbroken video stream. You'll be able to record in resolutions as high as 1080p without skipped frames. SanDisk Extreme CompactFlash Memory Cards are designed to handle whatever life throws at you. This card is backed by rigorous stress, shock, and vibration testing and includes RTV silicone coating for protection against shock and vibration. It operates in nearly any climate, with a functioning temperature range of -13 to 185 degrees Fahrenheit. The SanDisk Extreme CompactFlash memory card offers plenty of space to store high-resolution photos and Full HD videos. With capacities up to 128GB, the card can store thousands of photos and hours of video.